Josh Weissert graciously accepts our award. 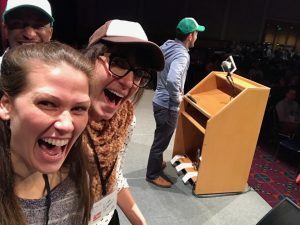 Joining him on stage are Channing Hunter, Kari Hidle, and Lisa Green. 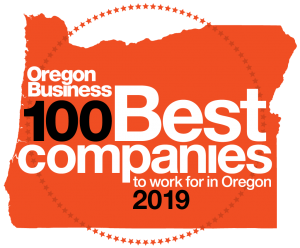 The 100 Best Companies list is organized by Oregon Business Magazine and involves an anonymous survey sent out to all employees that ranks workplace satisfaction. Topics include benefits, management, trust, work environment and career development. The survey is voluntary, free of charge, and independently calculated by Checkpoint Surveys. The full list is broken into Large, Medium, and Small companies, depending on how many employees they have. 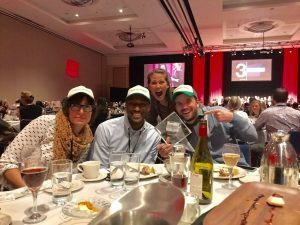 Aside from potentially earning a place on the list, it gives companies that participate a chance to review valuable feedback from team members to see where improvements can be made. The list continues but you get the idea. It isn’t only the benefits offered that contribute to the positive feedback we get from the team, the way we are treated both personally and professionally have a lot to do with it. 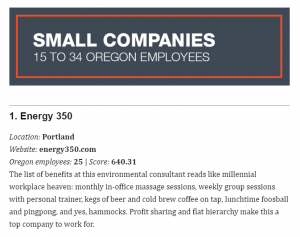 The management team at Energy 350 know how to take care of employees and does so effortlessly and modestly. From my experience, they do so because it’s just the right thing to do and that attitude is then paid forward through the actions of the team. There is understanding when personal situations arise that may require your time, a sick kid or an unexpected home repair project. Having that understanding from management is especially helpful and eases the stress of times like that. 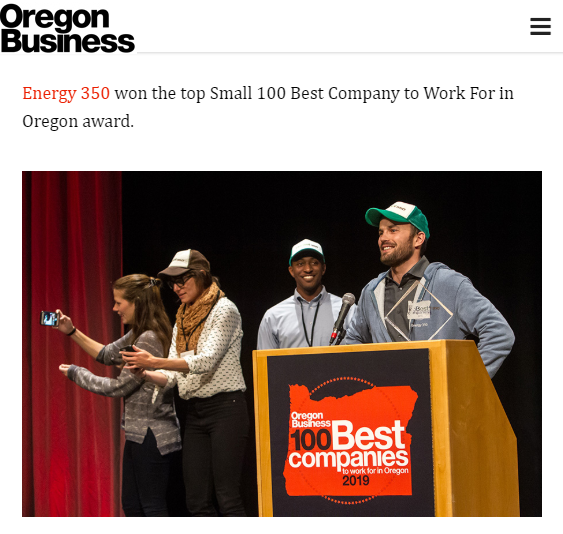 Creating a work environment like Energy 350 might seem like a challenge to most businesses, but the return you get when you invest in your employees is tremendous.